Revolution, independence and Communism are all words you might associate with the country of Cuba. You’d be selling it short though if you didn’t mention the late Celia Cruz, the singer known throughout Latin America and the United States’ hispanic communities as the Queen of Carnival. At the Hard Rock Hotel on Saturday March 16th, a concert paying homage to the vocalist whose career spanned 56 successful years, kicks off at 7pm. 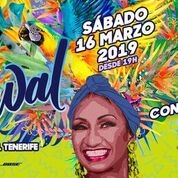 If you can’t make it to Carnival in Santa Cruz, this next Children of the 80’s themed night celebrating Salsa, Rumba and Guaracha music might just soften the blow. Start doing your stretches to shake it like Shakira!